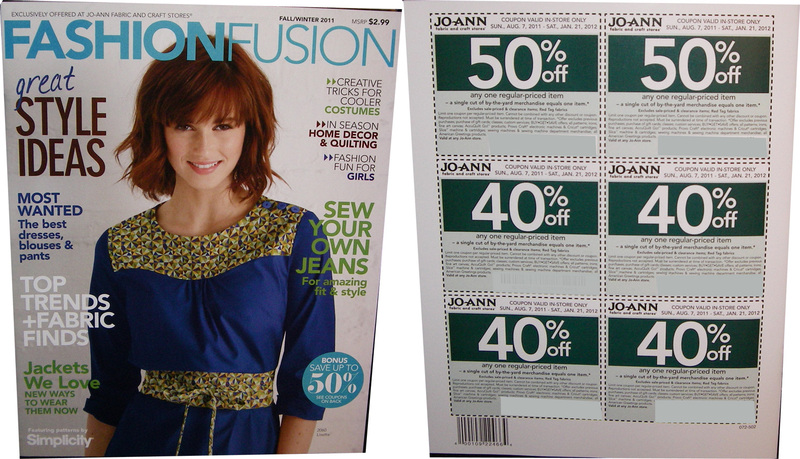 I stopped by our local Joann's this past weekend and they had the new Fashionfusion Fall/Winter 2011 magazine out. It is usually placed on the patterns cabinet. It primarily has pattern photos for Simplicity but it has a back page of 6 coupons (2 - 50% & 4 - 40% off) good for several months. 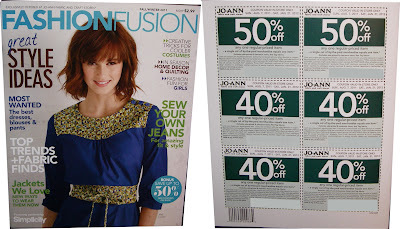 The current magazine's coupons are valid from 8/7/2011 - 1/21/2012. FINE PRINT: Unfortunately, they can not be used on the AccuQuilt Go products, Provo Craft products, or Cricut and Slice products among other things. The magazine sells for $2.99. I place several of these coupons in my purse for those just in case stops. I use them at Michaels and AC Moore as well since they take competitor coupons. I've saved a lot on larger purchases. They just can't be used on sale items which is sometimes hard to find and they can't be used online. Thanks for the heads up, Trish! !